Among Taylor's rosewood/spruce guitars, the 900 Series has always projected an aura of high-end sophistication, showcasing a detail-rich aesthetic and the most refined levels of Taylor craftsmanship. A lush redesign has brought a sleek and comfortable hand-carved ebony armrest to the series, along with the same sweeping array of tonal-enhancing refinements first applied to the 800 Series. On the 914ce, the Grand Auditorium's all-around versatility has been punched up to produce a more powerful bass response and a warmer, sweeter midrange. The refreshed appointment scheme boasts a beautifully calibrated balance of ebony binding and koa purfling, together with colorful abalone shell inlays and trim. 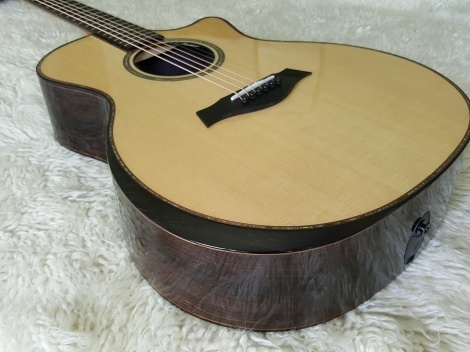 Additional features include a Venetian cutaway and Taylor's Expression System® 2 pickup. The guitar ships in a Taylor deluxe hardshell case.